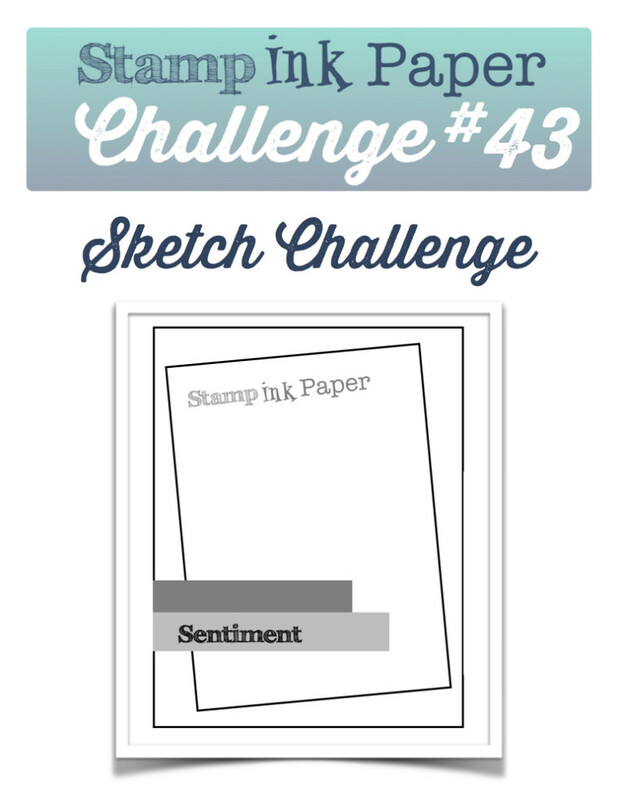 SIP Challenge 43 – A Sketch! Home / Blog / SIP Challenge 43 – A Sketch! So, how was your Monday? Mine was pretty good! I crafted with Andrea via FaceTime in the morning and managed to get three cards made! Love when the Mojo is flowing! It was supposed to rain yesterday but didn’t. It was chilly but sunny with a little wind mixed in for fun! I went over to my parent’s for dinner and then Danielle stopped by! I love having weekly visits from her! We chatted and listened to some music and watched some of Magic Mike XXL. After she left I ran to the bank and Target. There were of course rearranging the aisle that I needed to go down so I didn’t get much! Today I have some more crafting to get done, always a good day when there is crafting involved! 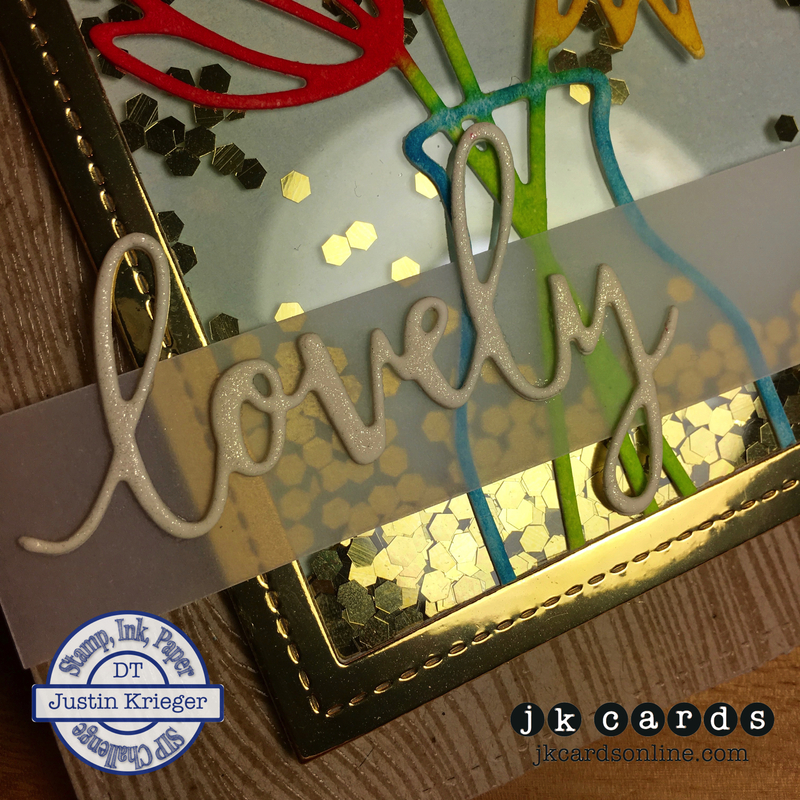 This entry was posted in Blog, Cards, Concord & 9th, Crafts, Embellishments, Embossing, Hero Arts, Lawn Fawn, Ranger, Simon Says Stamp, Stamps, Tim Holtz and tagged Card Making, Concord & 9th, Crafts, Hero Arts, Lawn Fawn, SIP Challenge. Bookmark the permalink. Awesome card!! Love the flowers and vase! Actually, I love everything about this card. 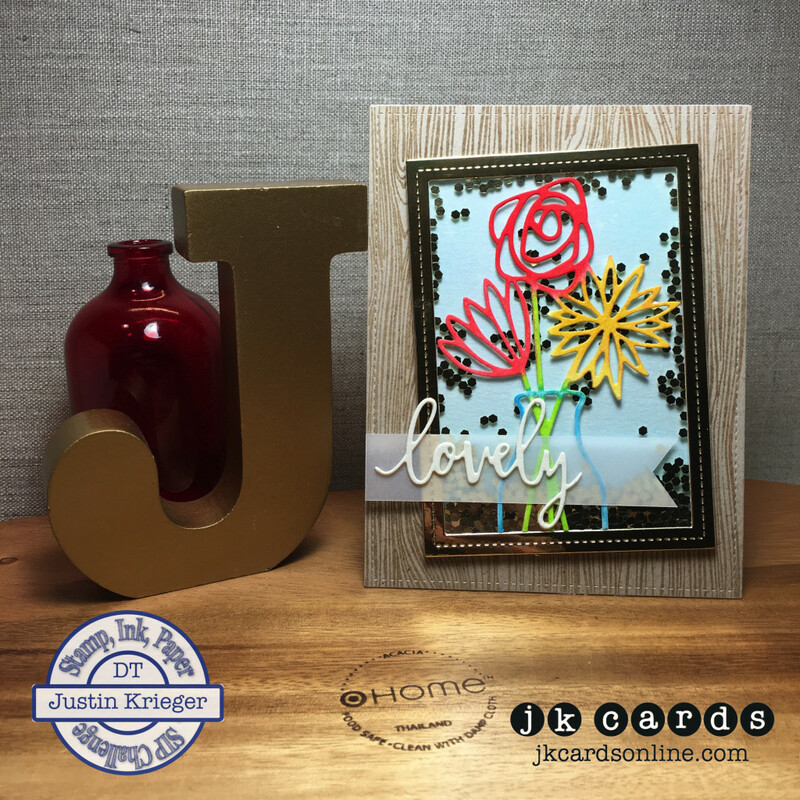 Justin, this is a very great card with the pretty bright flowers and all the glitz elements. Love it. Take care and have a fantastic day! Yeah! I love when you use that woodgrain stamp as a background. I find it to be one of the most versatile background stamps that I own. Also, the vase and flowers bouquet die is just gorgeous. I can tell you really had fun making this one Justin…………just as it should be. You know how I feel about a woodgrain background Grace! LOL! It is definitely one of my favorite backgrounds of all time! That Bouquet Die is awesome and yes, I had a load of fun making it! This is different! Gorgeous, love it! Take care…thrilled tomorrow is Wednesday!